An interactive collection containing four books where you say which way the story goes. Dragons Realm, Dinosaur Canyon, Deadline Delivery & Creepy House. Ride a dragon. Meet dinosaurs. Escape the evil Avocado Company. Save your cat. These stories depend on you. At the end of each chapter you make a decision that determines which way the story goes. Start by choosing which story to read. Things might get a little trickier after that. Oh … and watch out for the three legged dog! What Readers Say: This collection is great! I love the concept of this book because when I get to choose the way that the book will take me, it makes me feel like I am there. Another reason why I like this concept is that sometimes it’s hard to decide which way to go, so I can always go back and read what would have happened if I made a different decision…. something I can’t always do in life! I really liked getting four books in this set and I will definitely read more of the You Say Which Way books! Highly recommended. 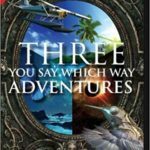 Why choose a ‘You Say Which Way’ adventure? Decisions have consequences and these books are all about choice. They are educational while being fun and informative. They are good books for girls and boys. Multiple paths and endings means books can be read many times. Interactive stories stimulate cognitive development.